« Rainey Rugby results Saturday 24 November v Omagh Academy. 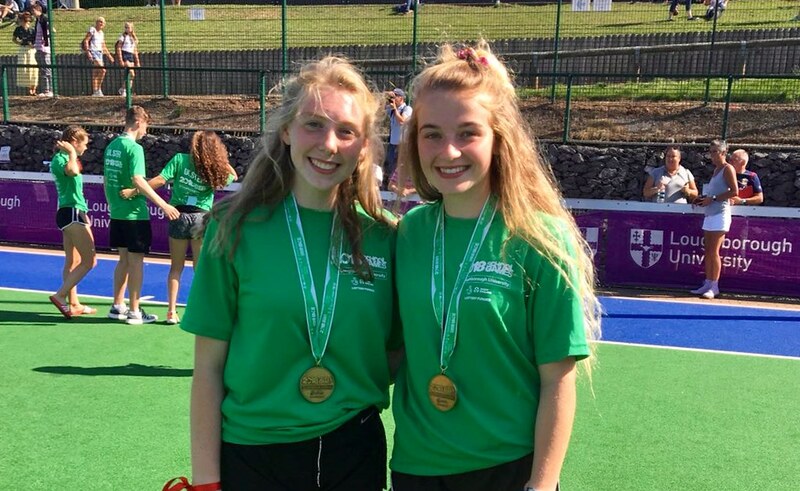 Congratulations to Charlotte Beggs and Ellie Montgomery who were selected for the Ulster Girls U18 squad for the UK 2018 School Games. The girls won all matches to achieve UK gold medals. Rainey was well represented yet again at the hockey Interpro’s with no less than five hockey girls and one coach! 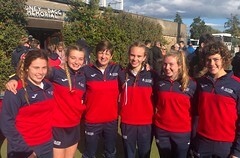 Huge congratulations to Honor Graham, Jessica O’Neill and Ellie Stewart who were selected for the U16 Team. 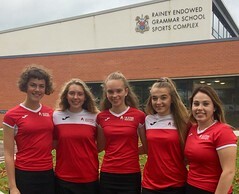 And Charlotte Beggs and Ellie Montgomery selected for the U18 Team. This is an amazing achievement girls really well done! Both the Ulster U16 and U18 Teams performed so well playing great hockey to achieve the silver medals. 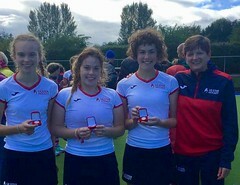 Ellie Jess and Honor received their first Ulster caps. Well done. Congratulations to Charlotte Beggs and Ellie Montgomery who were selected for Irish U18 trials from the Interpro’s and to Charlotte who has successfully made it through to the current U18 squad. Ulster’s Rainey Endowed Juniors as last year’s Junior Cup winners qualified for this All Ireland Tournament. The tournament hosted by Kilkenny College, took place on Friday 26th October 2018. Rainey won their first group match after coming from being 1-0 down against Connacht champions Salerno to win 3-2 on the full-time whistle. Gabi Scott scoring two and Ulster U16 forward Ellie Stewart the other. The girls then played Kilkenny College in another close game before again winning 3-2 with goals from Aimee McClure, Grace Fullerton and Ellie Stewart. As the group winners the girls then faced Loreto Kilkenny in the final. 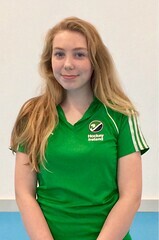 Rainey started very well and an Aimee McClure pass saw Ellie Stewart roof the first goal high into the net leaving the Kilkenny keeper no chance. The second goal was then secured by Aimee McClure herself after some great team play. But Kilkenny came back strongly and scored just on the whistle of half time. The second half saw a very close game played out by both teams but with no more goals Rainey were the winners. The Junior girls have made school history taking this first All Ireland Champions title after the Senior girls achieved bronze in the Kate Russell this year for the first time. Huge congratulations to all the Rainey girls on this fantastic achievement and to Judith Quigley the coach, the support coaching staff, parents and many generous sponsors from the local community. 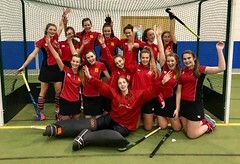 Ulster U15 Talent Development Squad – Gabi Scott, Imogen Graham, Alexa Hastings, Kirsty Stevenson, Imogen Millar, Aoife Doyle, Aimee McClure, Orlaith McHugh, Hannah O’Neill and Grace Fullerton. Ulster U17– Molly Clifford, Honor Graham, Dawn Francis, Alexandra McKinlay, Jessica O’Neill Ellie Stewart. 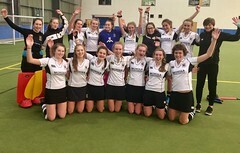 The 1STXI enjoyed a very successful SuperLeague campaign beating Ballyclare HS, Victoria College, Ballymena Academy and Down High to top their group and reach the ¼ where they beat Strathearn. 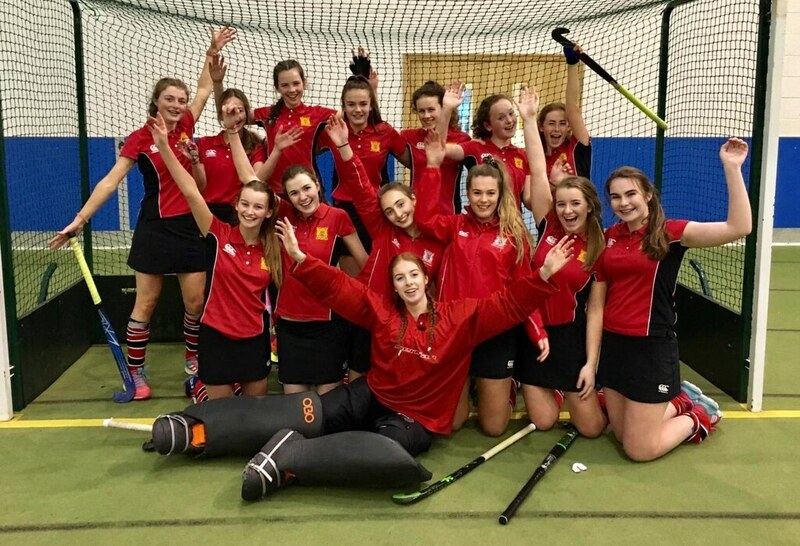 The girls then faced Banbridge Academy in the semi-final and although started well to go 1-0 up it was Bann who came good in the second half to win. The 1STXI now start their cup competition. The 2NDXI are through to the 3rd round of the McDowell Cup and the 3RDXI won their group to reach the ¼ final of the Gibson Cup. The U14 Team are also through to the 3rd round of the Junior Cup. Good luck to all teams in their matches.